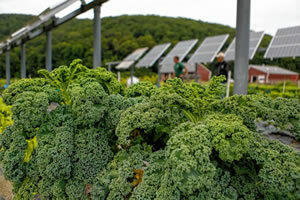 Fran Ryan for The Recoder: Massachusetts is known for its dedication to solar energy, as well as its efforts to increase the amount and availability of fresh local produce across the state. These two green goals, however, can sometimes end up as competing interests as energy companies eye large expanses of farmland for the installation solar arrays. With farmers increasingly using land to harvest the sun where they once grew crops, the farm at the University of Massachusetts Crop and Animal Research and Education Center on North River Road in South Deerfield is offering proof that solar arrays and agriculture don’t have to be at odds, but can actually exist together within the same field. It is called “dual use” and, according to Steven Herbert, professor of Agronomy with the Stockbridge School of Agriculture, who runs the research project at the farm, it is the only farm of its kind in the country. “Our philosophy is that we can put solar panels out in a field to help support the economics of a farm, while still keeping productive land in agriculture,” Herbert said. While some farms may grow certain crops near solar arrays, none actually grow food crops directly under the panels as they do at the South Deerfield farm, Herbert said. At present, the dual use demonstration portion of the farm sports two long parallel rows solar panels roughly 9 feet in the air. Each row has 36 panels for a total of 72.